Alum Spotlight: Kiana Williams | Maxine Platzer Lynn Women’s Center, U.Va. Former Women’s Center (Iris) intern Kiana Williams graduated in 2015 with a double-major in anthropology and women, gender, and sexuality, with a minor in film studies. For the past two years she has worked with the Virginia College Advising Corps, and this fall she begins a doctoral program in Cultural Anthropology, with a focus on “how neocolonialism influences Filipina identity, especially in context to popular culture, conceptions of beauty, and performativity.” We are so grateful to have worked with Kiana, and can’t wait to see her scholarly work evolve – and change the world for the better. 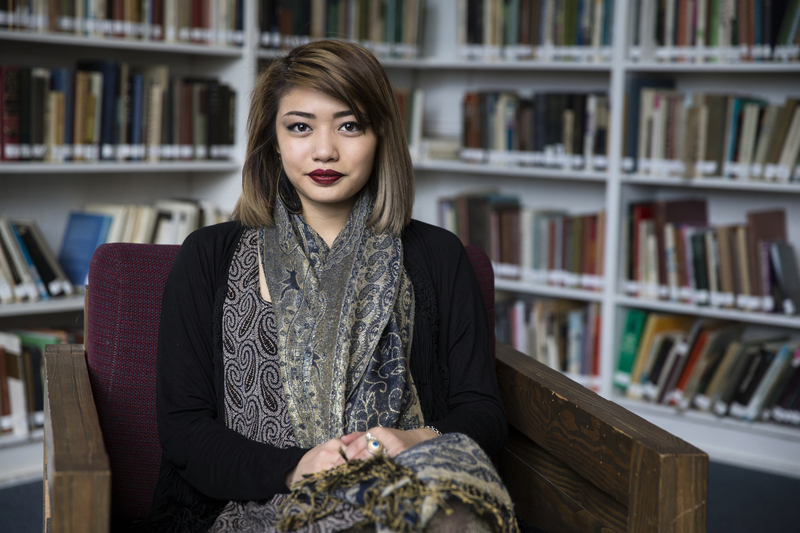 As a second-generation immigrant from the Philippines, I did not begin to seriously explore my cultural heritage until I transferred to the University of Virginia. I began to notice how much race and class impacted my daily experiences, which propelled me to get more involved in organizations that let me explore these issues. I became a facilitator for the Women’s Asian American Leadership Initiative and a member of the Organization of Young Filipino Americans. While writing for Iris Magazine, I also served as a literary editor for Inkstone Magazine, a student-run publication that focuses on the narratives of Asian American students. My undergraduate research largely focused on issues facing Asian and Asian Americans, and my interest in building on this research at a doctoral level came about quite naturally. The complexities that surround the Philippines as an independent nation in the face of globalization, paired with the tumultuous political climate both there and in America, has propelled me to take action in the best way I know how: forming human connections with others, then translating these experiences into research, in efforts to provide a catalyst for important, much-needed discussions. I plan to utilize my PhD in Cultural Anthropology to teach and continue conducting research in the Philippines. I very much enjoy the nature of college classroom settings, wherein difficult conversations are broken down by participants from all very different walks of life. More importantly, I wish to increase visibility of women of color in academia. During my undergraduate career, I only had three professors of color, none of which were women. I wish to be a mode of support for other minority college students, especially those who are low-income and first-generation like myself, while simultaneously producing new knowledges concerning the lived experiences of Filipina women. Tell us about the professional path that’s brought you where you are – completely planned, surprisingly organic or somewhere in between? My very first internship was through the Women’s Center with Iris Magazine. At the time, I had no idea what I wanted to do! I had just transferred from New York University, and the majority of my credits transferred in as Anthropology courses, a field I knew absolutely nothing about. Since I was already close to enough credits for a minor, I decided to try it out. My positive experiences at the Women’s Center – especially the creative environment and our ability to interview faculty and members of my community – had a tremendous influence on the rest of my academic career. I realized that through studying Anthropology, I could continue doing plenty of what I enjoyed during my internship. I went on to intern as a Casework intern for the International Rescue Committee, wherein I assisted with refugee resettlement services. At the end of my third year, I realized I consequently had enough Anthropology courses that were adjunct to the Women, Gender and Sexuality program to double major. All of my experiences that led me to finding my passion for teaching and research in Anthropology and issues affecting women were quite serendipitous, and I think that’s what made me so sure of my decision to continue pursuing these interests as a career… plenty of it happened by chance, but I felt like I was completely where I was supposed to be. Kiana with former Women’s Center interns, Kristina Brown and Katelyn Hebel at our 2016 Young Alumni Reunion reception. Since graduation, I have served as a college adviser through the Virginia College Advising Corps. I provide college access services to high school students, many of which are, like me, first generation and low-income. I also spent this past summer as an Education and Programs intern for Kluge-Ruge Aboriginal Art Collection. After my two-year term with VCAC comes to a close, I will transition into my PhD candidacy in Cultural Anthropology with a focus on studying the Philippines, diaspora communities, and construction of identity among Filipina women. Take advantage of the resources around you and remember the incredible amount of support you have at the Women’s Center; it will follow you even after your internship is over. Plenty of my amazing VCAC colleagues were also Women’s Center interns, and I wish I had gotten to know them better while we had the chance! There is no “cookie cutter” feminist. A person can have their own personal opinions that might not line up with “mainstream” feminism, and that’s completely fine; we should not discourage others, just because each other’s views are not perfectly aligned. No one is going to have all the right answers. Feminism is an all-encompassing term that can mean many different things to different people; the important thing to take away is that the mission should always be to fight for justice. In a similar vein, we as American feminists should be careful about invoking our Western feminist narrative on other cultures. I am a strong proponent of cultural relativism, and seeing how many of my colleagues can tend to take quite the (albeit well-intending) ethnocentric stance, I believe we all need to carefully find where we “fit” in our allyship with women from other countries rather than instructing them as if our own nation is perfect. What’s your most unpopular opinion? MTV’s Jersey Shore is a national treasure and should be preserved in our National Archives. Also, 2007 was the golden era of American pop culture. Who’s going to play you in the movie of your life? Did you know that Asian Americans only make up about 3% of titular characters in American film and television? I have slim pickings, so I’ll go with Constance Wu. How best can WC students/interns fight the good fight during this turbulent time? Learn to listen to others’ voices, even if their ideas radically challenge your own. In these divisive times, there are important conversations to be had, and it takes active communication with those we vehemently disagree with, rather than Facebook fighting or convincing someone to hold an opinion that coincides with your own. Get active in our community. Attend rallies and utilize the fact you know so many other college students as a platform to encourage others to mobilize, as well. Also, think about intent. I think we often assume that those with opposing opinions must not have the best interest in mind, when sometimes that is not always so. Most importantly, take care of your mind and body; with all the stress in the world, sometimes we forget that in order to “fight the good fight,” we need to advocate for our own self-care.